Interest for hydrates began when researchers found that natural gas hydrates can block gas transmission lines even at temperatures above the ice point, after the discovery many researchers starting from Hammerschmidt, Deaton, Frost investigated the effects of inhibitors such as salts (chloride salts...) liquids (methanol, ethanol, glycols as mono ethylene glycol MEG etc.) on hydrates, thermodynamic inhibitors lower the freezing point and thereby reduce risk of hydrate formation. The necessary condition for hydrate formation is the presence of water (or ice), gas hydrates can form from dissolved gas or free gas. Thermodynamic inhibitors such as methanol, ethanol, mono ethylene glycol (MEG) etc. can reduce kinectics of nucleation, other inhibitors can reduce agglomeration of hydrate crystals. Several methods are available to predict hydrate formation conditions, the old methods (Wilcox, Katz etc.) allow direct solutions while more recent methods based on Van der Waals and Platteeuw theory require a computer software. 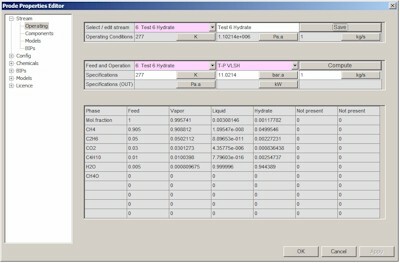 The multi phase flash procedure in Prode Properties solves multi phase equilibria including solid and hydrate phases, given operating conditions and compositions the procedure calculates fugacities plus derivatives of each phase and the second order solver identifies the correct solution. A phase stability step removes unstable phases. The procedure doesn't require the presence of a free water phase and can include single or mixed salts (with electrolyte models). Prode Properties includes two different models for hydrate phase, a simplified method and a complex method, both based on Van der Waals and Platteeuw theory. 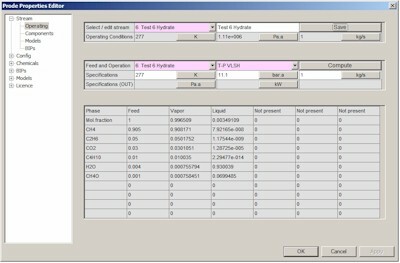 Prode Properties allows to select differnt models for vapor, liquid and solid fugacities. Here, errors (for about 100 points) are determined as difference in hydrate formation pressure calculated by Prode Properties with CPA-PR model vs. measured data sets. You can contact Prode to receive the complete data set with calculated data and the reference in literature. 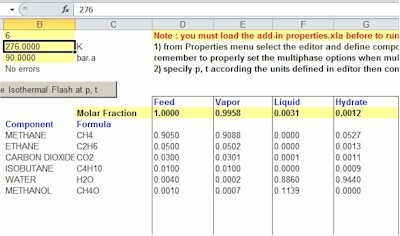 This Excel application example shows how to use Prode Properties to solve the multiphase flash operation including hydrates and get the results directly in Excel pages. First step: calculate multiphase equilibria with solids (hydrate formation) from Prode Properties Editor. You can evaluate how the addition of a small amount of methanol (inhibitor) can increase the formation pressure for hydrate phase, we recalculate phase equilibria with a 0.002 mole fraction of methahol, as result we must increase the operating pressure to detect a hydrate phase, hydrate formation pressure is now about 70 Bar. With Prode Properties you can calculate the hydrate formation temperature curve or the hydrate formation pressure curve and print a graph in Excel.